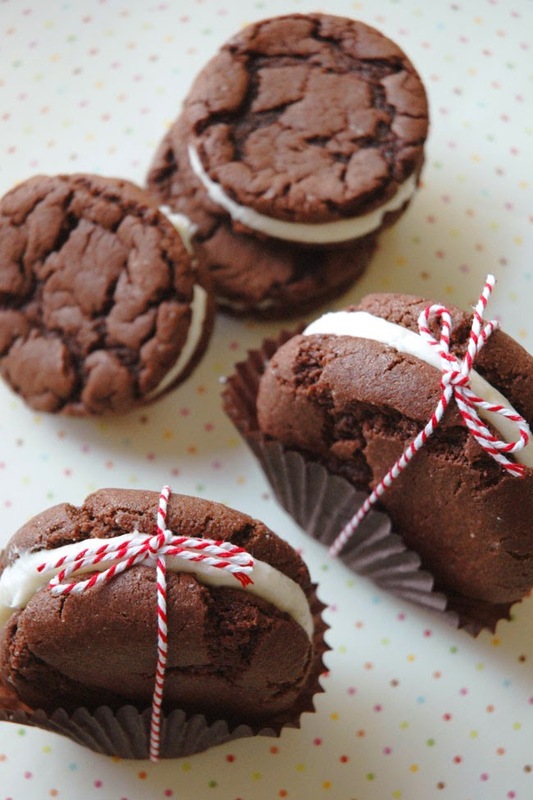 Want a REALLY cute idea for wrapping up treats for celebrations, picnics, or food gifts? I'm just loving how easy it is to take a cupcake liner (or cupcake wrapper - whatever you want to call it) and add a little bit of creative fun to any dessert presentation. just keeping your treats separated when packaging them up as a gift. 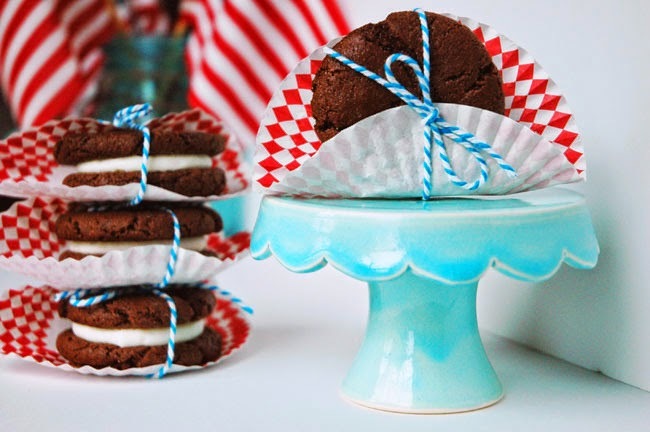 It's amazing how you can turn this simple little treat into an adorable and patriotic whoopie pie using a little bit of blue baker's twine and a red + white cupcake liner. I LOVE them! Don't you? 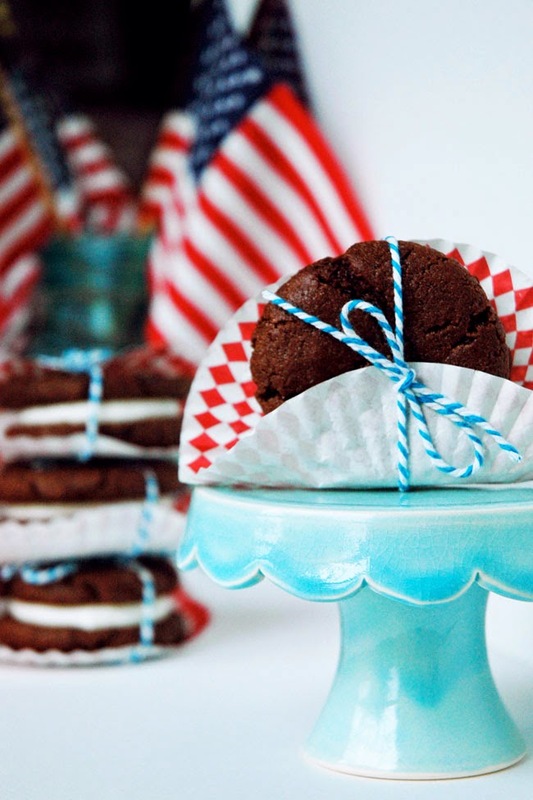 I used this same idea when I made some oversized whoopie pies for Ella's teachers this year during Teacher Appreciation Week. I used brown cupcake liners and red baker's twine this time! If you are concerned about protecting your individual dessert you can even slide it into a cellophane bag and tape it closed with some cute washi tape. Done! Maybe you can use this idea at some point during your Red + White + Blue festivities this weekend? Or at least PIN IT for later this Summer! 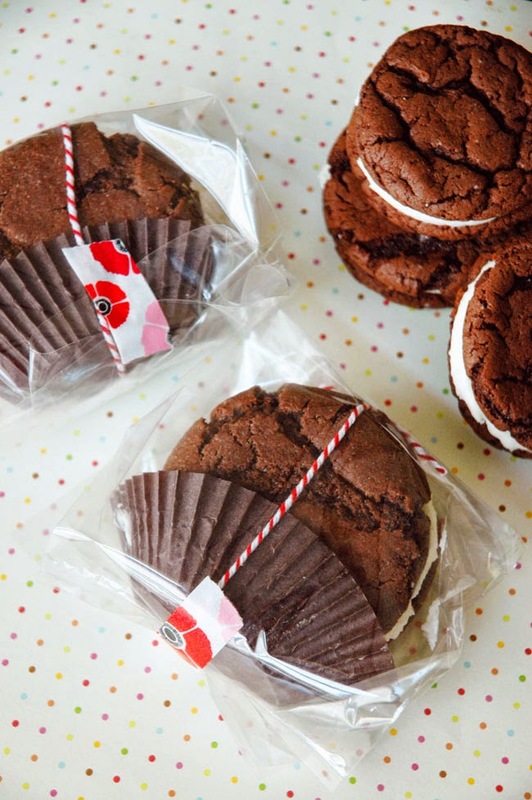 Want the recipe for those amazing Whoopie Pies? Well you are in luck!! Hint: You want your dough a tad shiny and pliable but not too oily. Dough should pull clean from the sides of the bowl during the mixing process and should not be sticky OR too oily to work with. Remove from oven and let cool for 1 min. Using a mixer cream butter. Add cream cheese and mix well. Add vanilla, stirring until well blended. Sandwich two cookies together by squeezing 1 tsp. (or so) of the filling onto the center of one cookie. Add the 2nd cookie on top. Lightly press the two cookies together to help the filling spread evenly to the sides of the cookie without spilling over the edges. (unless you prefer it). You can either serve them as-is or freeze them for a frozen treat – that’s my favorite way to eat them. You can also make-ahead, freeze and bring to room temperature on the day of your event/party. • Using a mixer, I use my paddle attachment and blend until the dough comes clean from the side of the bowl. • Although it’s recommended to use a greased cookie sheet for baking, I skip that part and mine are fine. • If the dough seems too sticky to work with, I have found by letting the dough sit while you make the filling, works like a charm. 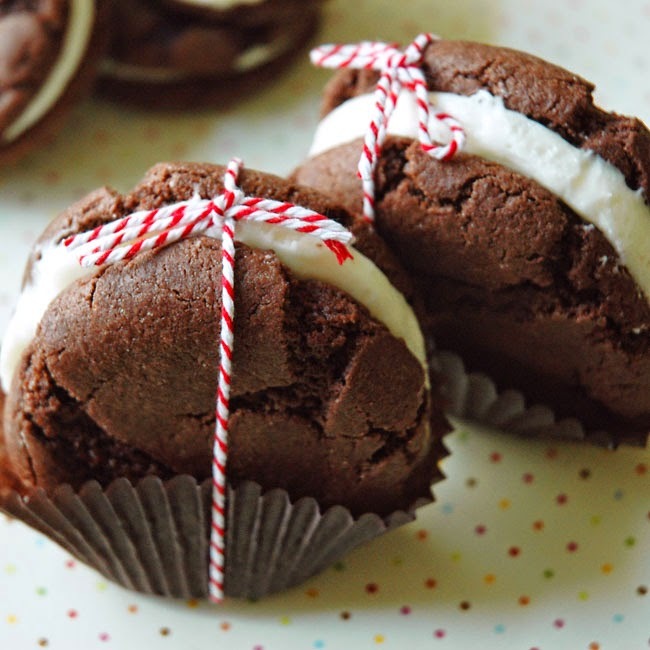 • Instead of piping the filling, you can also just use a butter knife and spread it on. • If you are going to eat these as a frozen treat, I found that by reducing the baking time by a minute or so will allow for a less crunchy frozen treat experience. Basically, you want a softer cookie before freezing so that you can easily bite into the frozen treat and enjoy a less “crumbly” experience. • Need enough to feed a large crowd? I made 50 - 2" whoopie pies for the school staff during Teacher Appreciation Week and I ended up needing 4 boxes of Devil's Food Cake Mix - in other words, I quadrupled the recipe. Disclaimer: When quadrupling the recipe I did NOT mix it all up together so I can't guarantee the results if you decide to throw it all in one big bowl. Hope you have a safe and fun Memorial Day weekend!! I've already tested out other treats too using this same packaging concept. Adorable. Promise. I'll share more soon.